In 2017, researchers from Virginia Commonwealth University completed a four-year study of the sustainability of commercial snapping turtle harvest, funded by the Virginia Department of Game and Inland Fisheries. The primary conclusion of that work, coupled with information submitted by harvesters in annual permit reports, is that the unregulated (unlimited) harvest of snapping turtles is not sustainable in Virginia, especially in coastal waters. Without some limitations placed on the industry, local populations of snapping turtles have been and will be lost, impacting both the industry itself and, importantly, the ecosystems in which these turtles live. Limited regulation is preferred by staffs and harvesters to a moratorium on commercial harvest, which would protect and allow local populations of snapping turtles to recover. The snapping turtle is the second largest freshwater turtle in the United States. The geographic range of the snapping turtle is extensive. Snapping turtles are long-lived, with an estimated maximum life span in the wild exceeding 50 years, with males growing larger than females, and maximum weights exceeding 50 pounds. Snapping turtles become sexually mature at approximately 7 years of age in eastern Virginia. Female turtles lay a single clutch of 26–55 eggs annually on average, with low hatchling survival. Snapping turtles continue to lay eggs throughout adulthood, and lay larger clutches as they grow in size; older, larger females are critically important to long-term population growth and sustainability. Many iconic and once-plentiful turtle species, such as the Central American river turtle, the pig-nosed turtle, and the alligator snapping turtle, have experienced steep population declines due to overharvesting and are now at historically low levels across much of their ranges. Turtles are commercially harvested for their meat, which feeds both local and international markets. China is the world’s leading consumer of turtle meat, and Chinese consumption is considered a primary threat to the world’s turtle populations. The collapse of Asian turtle populations over the last few decades, largely due to overharvesting, has resulted in a shift from domestic harvest of wild turtles to aquaculture and international import, thus increasing harvest pressures on turtle species around the world. Over the past 15 years, snapping turtles have come under increased pressure from commercial harvesters to meet the demands of the international food market. Increases in the US export of live snapping turtles raise concerns for the viability of the species. Females are generally exported live to support aquaculture, but the bulk of males harvested in the US are butchered, canned, and exported as processed meat. Pregnant female snapping turtles fetch the highest prices from turtle exporters, as the presence of eggs increases their value to farming operations. The commercial harvest of snapping turtles can be highly variable, largely driven by availability of turtles and by market prices. In 2013, more than 125,000 pounds of snapping turtles were reported as commercially harvested from Virginia waterways. Actual harvest, including recreational collection, is likely higher. Based on annual permit reports, the 2013 harvest nearly doubled the harvest from 2012, and represents a nearly 1300% increase in recorded harvest since 2002. Turtle harvest laws and regulations in neighboring states have been tightened, which has resulted in increased pressure on Virginia’s snapping turtle populations. The North Carolina Wildlife Resources Commission imposed a moratorium on commercial fishing of snapping turtles until the sustainability of harvest could be studied, and followed up that moratorium by instituting bag limits on commercial harvest. 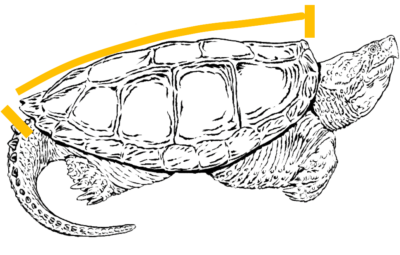 Increased restrictions by the Maryland Department of Natural Resources included increasing the minimum size limit from 9.5 inches curved carapace length to 11 inches, and limiting harvesting to tidal waters only. 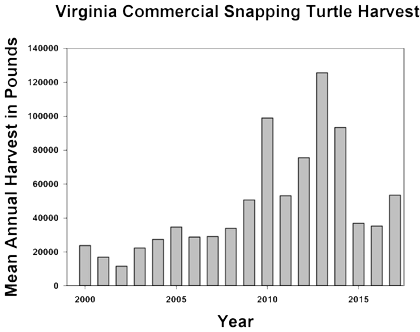 High turtle prices, combined with stricter regulations in neighboring states and weak regulations in Virginia, likely contributed to an increase in the number of Virginia commercial harvest permits sold to out-of-state watermen, from 1 to 26 over the last 15 years. From 2009-2013, out-of-state harvesters, representing one-quarter of the total number of permitted harvesters, were responsible for as much as 70% of the annual reported harvest (approximately 360,000 pounds). The increase in the number of harvesters (especially from out-of-state) and the 1300% increase in snapping turtle harvest provide strong evidence that existing regulations are not sufficient to ensure the sustainability of Virginia’s snapping turtle populations under the current commercial harvest regulations.